IA Design has created a new office environment for Element, a planning and urban development firm, located in Perth, Australia. A key driver of the Element project was to shift away from a siloed approach and move towards a collaborative and inclusive workplace. This was especially important because, since merging, the two organisations of TPG and Placematch were still seen as separate entities. Appreciating the functional and aspirational needs of each unit was key in creating an office space that would support all business units. Following the completion of the project, TPG + Placematch underwent a re-branding exercise to their new business -Element. Their new office space formed part of their new branding and IA Design worked closely with the re-branding team to ensure that it was captured and integrated with the new fit out. Element’s work lies mainly in the domain of the urban built environment and they needed their office space to reflect this. Inspiration was taken from the urban language of the streetscape and expressed in space planning, detailing, finishes and materials. Floor tiles in the lift lobby which mimic street pavers welcome visitors to the space, referencing an urban streetscape. Stairs, designed with an industrial aesthetic in mind, feature solid timber stadium seating with steel and concrete details which emphasize the raw materials often found in urban settings. By blurring the lines between the front of house area, breakout and office space, IA Design delivered a space where staff and clients would feel comfortable and welcome. The workplace was designed without any hierarchy, with every office and meeting space available to all employees. 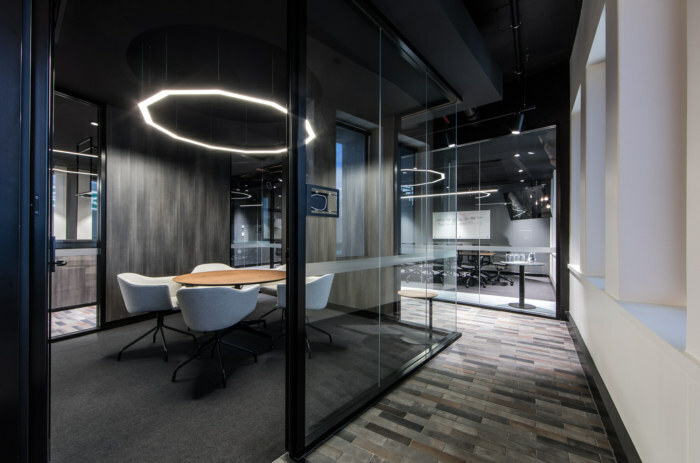 IA Design successfully achieved an open plan office space that reflects a connection between the urban space and the office space. The final outcome captures the urban aspects through elements of the streetscape and raw, natural finishes. Despite constrains and limitations faced along the way, IA Design has provided an environment that has positively impacted the way that Element work, both internally and externally, with a connection to place.